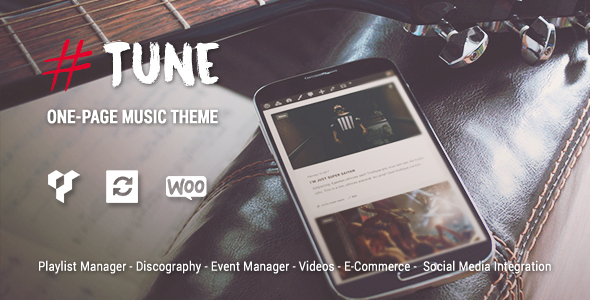 Tune is a one-page music WordPress theme made to be simple and ready to use. It includes all the features you need to create a solid fan base online: music player, social media integration, event list, discography, video & photo gallery, and so on; and it doesnâ€™t require any coding knowledge. Import the demo content with one simple click and edit the content directly or unleash your imagination to create your own concept. Visual Composer is â€œset as themeâ€. The frontend editor and grid builder module is not active. Server requirements: PHP 5.4 or greater, max_execution_time 120, memory_limit 96M, max_input_vars 3000, post_max_size 32M, upload_max_filesize 32M.